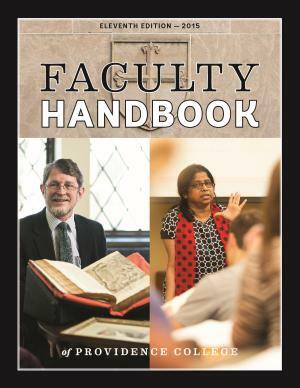 The eleventh edition of the Faculty Handbook of Providence College is the official statement of the policies of the College governing faculty status, rights and benefits, and professional responsibilities. Members of the faculty shall give particular attention to the sections dealing with the Mission Statement, the Statement of the Objectives of the College, and the Professional Responsibilities of the faculty, since the acceptance of these sections is included in the acceptance of contracts for teaching services issued by Providence College. This edition supersedes all previous editions, supplements and all acts and amendments related thereto approved by the Board of Trustees of Providence College since May 24, 1971. This edition will be reviewed and amended as needed to reflect approved changes in content. General reviews will be scheduled in conjunction with the College’s decennial self-study. Publication date: June 2015; Updated as needed. Please refer questions to Patricia Sickinger at psicking@providence.edu or 401.865.2155.